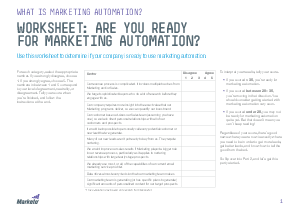 Worksheet: Are You Ready for Marketing Automation? Use this worksheet to determine if your company is ready to use marketing automation. Regardless of your score, there’s good news: where you are now is exactly where you need to be in order to get more leads, get better leads, and know how to tell the good from the bad.